This unit adopts the same styling of Afrormosia hardwood case, satin anodised silver front panel that complements the Synthi VCS3. 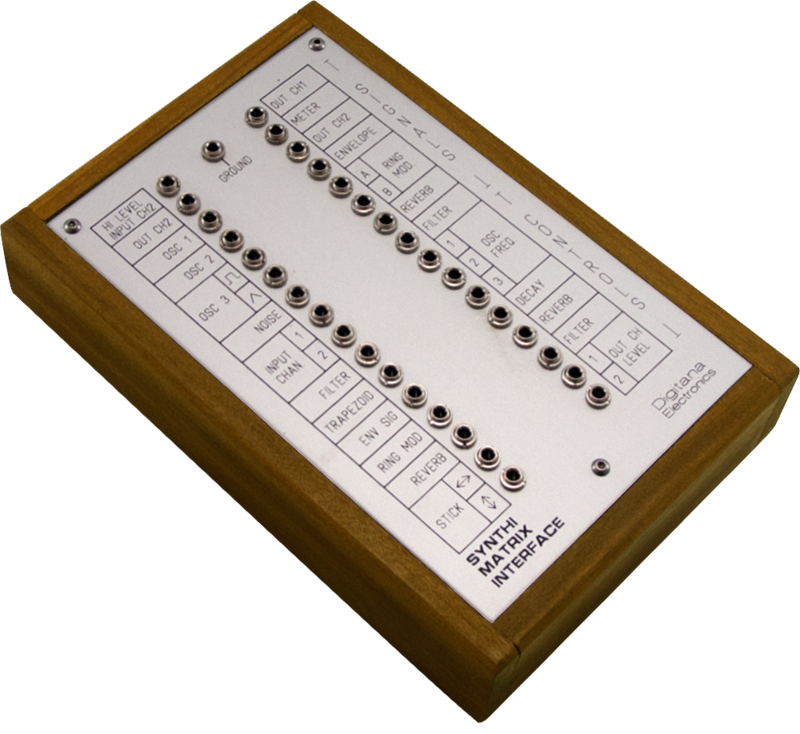 It's a complete interface unit for the Synthi VCS3 Mk2 Matrix... or in other words a 'breakout' box whereby the row/column signals of the Matrix are taken out to 3.5 mm jack sockets. This allows powerful interfacing options of the Synthi VCS3 with an external modular synthesizer like, for example, Doepfer-Eurorack and/or external effects racks etc. It's a unique device which can allow amazing synthesis of your Synthi VCS3 to external equipment and really unleashes the power of matrix patching. All the signal/control inputs (right hand column of jacks) have 2.7k series resistors connected internally so taking signals in or out of the matrix using standard 3.5 mm mono jack plug cables via this breakout box gives the same attenuation as inserting standard matrix resistor pins. Connection to external synthesisers etc. is via standard jack plug leads (i.e. with signal at the ‘tip’ of the plug) with 3.5 mm mono jack plugs used to connect to the interface unit. These connections also join the ground of the external equipment to Synthi ground which is important. Patches can be a combination of those created with patch pins in the usual way and jack leads from the unit to route Synthi signals out to external equipment and send external signals (such as waveforms, envelopes, filter out, effect etc.) back into the matrix. In this way the unit can act as a unique interface, leading to a powerful combination of Synthi VCS3 sounds and external modular synthesisers/effects and signal processing equipment.